Throughout their wedding planning journey, engaged couples are faced with hundreds of decisions and experience many emotions. 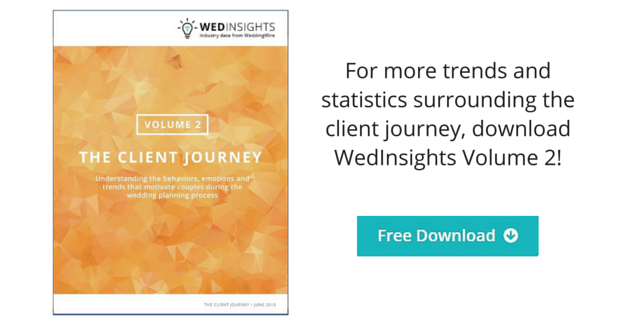 As a wedding professional, it’s important not only to recognize where your clients are in the process, but also determine where and how you fit into the client journey. Understanding this process is key to booking more clients, as it can help you educate the couple, personalize their experience, and instill confidence. Couples spend most of their time looking for vendors online, so it’s important to make sure you have an impressive online representation of your brand and offering. If a bride or groom can’t find the information they want on your website, third party business profile, blog or social media profiles, you are likely missing out on additional bookings! Make sure you’re telling a compelling story and relaying key information that couples are looking for, including pricing information, reviews, and high-quality photos. Many factors come into play when planning a wedding – from who’s getting married to who’s paying. Don’t rush the process! Take a step back to observe and listen to your prospective clients along with their wants and needs for their big day. It usually takes a few conversations to develop a rapport, so don’t feel pressured to close the sale during your first phone call with a prospective client. Asking the right questions will help you understand what they’re looking for and how your business can be the right choice for the role. Understanding where you fit into the wedding planning journey can help you book more clients by focusing your efforts at the right time. If your business does not fall into one of the categories above, perhaps there are other Pros in your area who would be open to collaborating on a cross-marketing offer to introduce yourself earlier in the planning process. Think about what decisions are on their plate, and ask about their wedding vision to tailor the conversation and help meet their specific needs. Since budgeting plays a critical role in the planning process, don’t avoid price questions; use them as opportunities to educate the client and sell yourself as the perfect solution. Often clients don’t know what else to ask, so have a conversation to further understand a couple’s motivations and mindset, and explain how your service (and price) can help fulfill their vision. Remember: price questions are usually buying signals, so take advantage of the fact that your business is still in the running to be selected!